Ack! Can you believe it's coming up on a year since I finished this quilt top and I still have to finish it nevermind quilt it?!! With spring around the corner, I'm feeling motivated again to git 'er done. 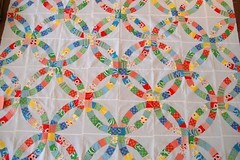 The fabric in this quilt is mainly Denyse Schmidt's Katie Jump Rope against Kona Snow. My year has been off to a busy start. Feels like every time I glance at a calendar, a new month is coming to an end. In mid-December, I moved into my long-awaited loft (LOVE IT!!!) and since then have been settling in, taking my time to feel out the new space and sizing up where and how I want to arrange my things. I forgot how long the process of settling into a new space can take and I'm still waging a battle against the boxes. However, this week I saw the light on the horizon and how I'll conquer the last frontier (read: the den). Now that I have my plan in place, my goal is to have all the boxes fully unpacked and everything in its place by Easter (which sounds far away but isn't given my various work and travel commitments in the meantime). On the quilt front, I finished basting a quilt for a very special man. Now I need to sew like the wind to finish quilting and binding before his birthday this weekend. Hope 2010 is being good to you and yours.